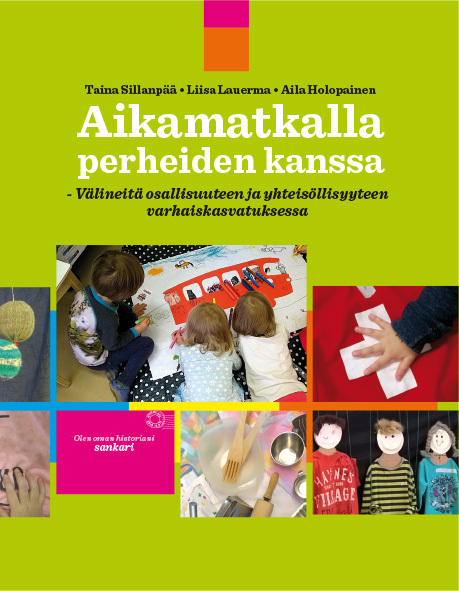 The aim of the Time Travel project (Aikamatka in Finnish) is to increase the social well-being of children and families by reinforcing their awareness of their roots and identities. CLIMB UP INTO YOUR FAMILY TREE! Time Travel connects the childhood memories of different generations and family histories. We collect, share and process the memories using art educational and activity-based methods as part of a long-term themed project. The variation and cultural diversity within a family’s history is part of its richness. Discoveries related to one’s own family history support interaction that encourages respect for difference. Different memories are activated at different times in our lives. A story told by someone else may open the gates to secret gardens in our own past. Time Travel encourages and challenges us to talk about our own history: to question, to tell, to listen. Time Travel endeavours to develop tools for inter-generational learning. Our own history is mirrored in our ways of parenting and raising children. Strong and unique childhood memories are an empowering resource.